Anyone else feel like this week was a chaotic? Not a bad thing since it always makes it go by faster, but I definitely needed some R&R after it all. But I have a brand new list of links to share for this week that you might enjoy, or at least I did! Since we’re working through a photoshoot brief at work, I was able to dig through and find a ton of new creative content. Website inspiration: https://www.frankiemusic.com/ — how cool is this website? Don’t ask me how I stumbled across it but it’s the coolest interactive site I’ve seen in a while. The company who designed it seems to have a lot of experience with musician sites. Cool photographer: https://www.instagram.com/ladyist/?mc_cid=8ef9facb8a&mc_eid=3f2c8152e3 — I found Ashley through a newsletter I subscribe to called https://girlgaze.tv/ which is a hub for young, female creative. Her style is so different compared to any other accounts that I’ve seen. There’s a retro/magical feel to each photo. It makes me want to get into film photography so bad. Interior Design Inspiration: https://www.domino.com/content/dassie-artisan-british-decor-company/ — lately I’ve been really digging into interior design thanks to my friend Jenny. She’s got the cutest little apartment in Lincoln Park that’s gotten so creative with the creating a cohesive space. It’s so inviting and cozy — I think she should do a apartment tour on her blog to be honest. Pattern Designer/Illustrator: https://www.instagram.com/briandafjstuart/ - yes to all of it. Chicago floral designer: https://www.instagram.com/jkrejnik/ - I can only image what one’s life as a floral designer would be like, I feel like you would be in such a calm state of mind being around that many beautiful things. Female empowerment: https://www.the-wing.com/ - in honor of the the Woman’s March this weekend I thought I would share this cool site. It’s essentially a community/networking space specifically designed for women. While the concept isn’t new I definitely want to learn more about becoming involved. That’s all for now folks! Tune in next week…..!! To say I spend a lot of time on the internet would be an understatement. But I can’t help it, I love it. It’s such a mindblowing creative space where you can gather so much inspiration. So I figured I would share some links that spark my interest, mostly photographers, illustrators, fun/interesting articles, graphic/website inspiration, etc. This series showcases everything that inspires me and makes it accessible those who are interested. if these sites spark your interest, which I hope they do, that makes me happy. I did a series like this a while back and I enjoyed it, so I’d like to think of this as round two, only it won’t be dedicated to a specific topic. I’m mostly inspired by Swiss Miss and Cup of Jo who share the things that they love or appreciate on a weekly basis — highly recommend both blogs if you have some time. Trader Joe’s ho: https://www.domino.com/content/underrated-trader-joes-products/ — I’m not ashamed to call myself of Trader Jo “ho” because I love that place so much. They can do no wrong. I saw this list of products and was instant intrigued to pick some up on my next trip. Photographer: https://www.aprettycoolgirl.com/ — I really like her style of photography — it’s a mix of the dramatic with a little bit of fun behind the scenes. Street culture: https://www.notre-shop.com/ — between my brother and my boyfriend I’ve found myself diving more into street culture and it’s so fascinating! This is a local Chicago shop that I found through their YouTube videos. They created one with Alinea (a very fancy restaurant in Chicago) and I was amazed by how sneaker heads have taken their love to the next level. Cool artist: https://www.instagram.com/kindahkhalidy/ — her art is so fun and playful. While I tend to be more neutral with my colors I love seeing artist go bold with their color palette. Illustrator: https://www.instagram.com/martinamartian/ — she’s just too cool not to share. Her work is so fun and radiates happiness. Cool rendered images: https://www.instagram.com/teaaalexis/ — if you’re looking for a fresh dose of inspiration this is the best. I know there are quite a few accounts like this but I’m so fascinated by the world of 3D renderings and this one feels like you’ve entered into an entirely different world. Website design: https://ballyhooandco.com/ — I love colors of this site. It’s fun and showcases their services in a way that would get clients excited about working with them. One of my New Year Resolutions was to be more mindful about the amount of time I spend on my phone. I read a bunch of articles and deleted some time-consuming apps that just weren’t necessary. One day I stumbled across this podcast called Hurry Slowly — which is all about being mindful about our use of technology. The host of the podcast created an online “Reset” course that starts on Jan. 19th that I decided to join. The https://reset-course.com/ seems like a great way to get “re-focused” what’s important and what things are time-wasters or not helping my overall well-being. It's finally the weekend! 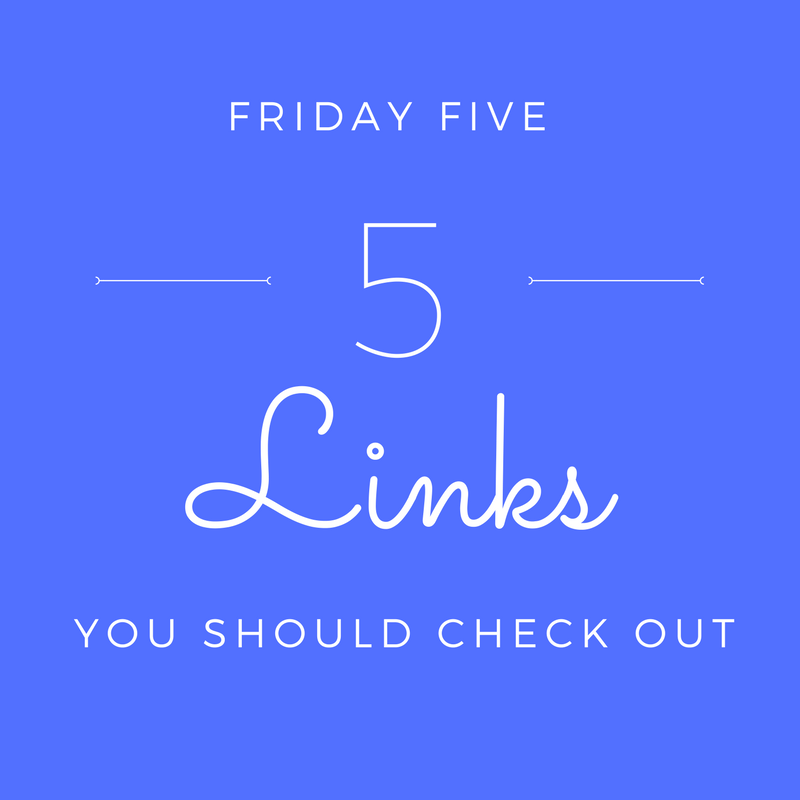 If you have some down time, here are five links you should check out! If you're looking for a little inspiration, you've come to the right place. This week I wanted to highlight some Instagram accounts that spark my creativity.